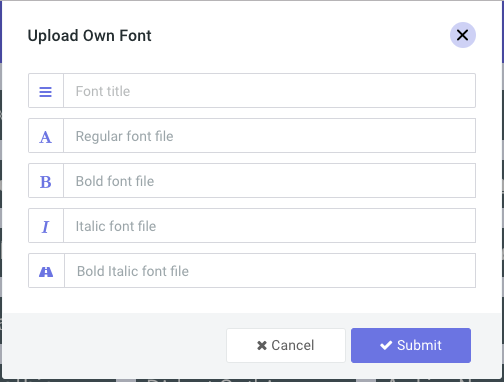 Your default PitchPrint domain comes with a few set of general fonts but you can add your own custom fonts to enhance user choices and creativity. There are two types of Fonts required for the application to function properly. The TTF and Woff font file types. The TTF is used in generating the final PDF file while the Woff is a web based font file system used predominantly in browsers because of its light weight and faster loading time. Luckily now PitchPrint requires you to upload only one font file of either format. The application will convert and create the other missing format from the uploaded file. From experience, it’s best you upload a full TTF Font file though Woff also works fine in converting to TTF. So to get started, navigate to your Fonts Page and click the “Upload New Font” button at the top. Regular Font file – This is required. You need to upload here the TTF or the Woff version of the font file in normal, i.e without bold or italics, just the normal font file. Bold, Italic, BoldItalic Font files – These are optional and can be left blank if you don’t have them. The app will adjust to show that the font does not have a bold or italic version depending on whether you upload them or not. Once you have set these, Submit and wait a little while. The app will generate a thumbnail of the font file and can be accessible from the front end of your store. If it is not showing on your store, perhaps you need to include it in your design if per chance you have excluded all fonts or you have only included a select few in your design.